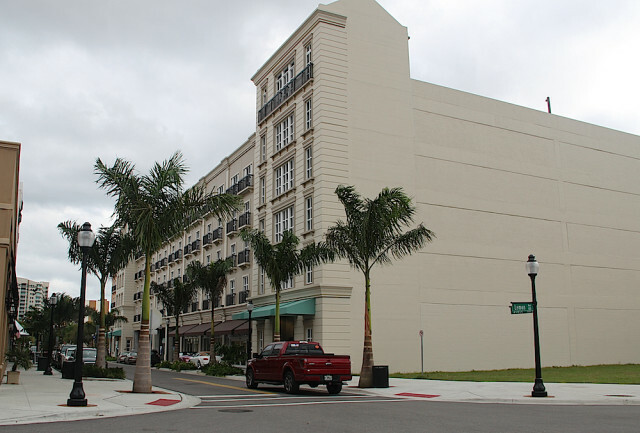 The City of Sarasota has begun charging a flat $5, all-day fee for parking in its public garages during special events that bring high volumes of visitors — and cars —downtown. 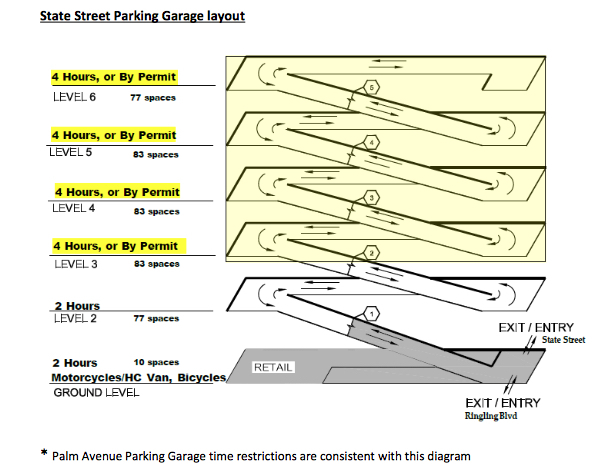 The expense is one of several measures the city has recently implemented to increase its parking department’s revenue and to better manage turnover of spaces and accessibility in its garages on Palm Avenue, State Street and Second Street (with two floors of public spaces). The changes were approved as part of the 2016 fiscal year budget process. On Monday, Jan. 4, the city commissioners heard a presentation by Parking Division General Manager Mark Lyons regarding two of the measures as the city prepares to work on a more comprehensive parking strategy. Along with the $5 fee, the city has put in place a two-tiered time restriction that “creates a differentiation between cars parking for short term and long term [parking in the garages], and accommodates selling employee parking permits,” according to memo Lyons wrote. The lower public garage levels now have a two-hour restriction, while the upper decks restrict parking to four hours, allowing more turnover on the lower levels for visitors who spend less time downtown, Lyons indicated. Another recent change doubled the fee for downtown employee parking permits that allow workers to exceed weekday time restrictions. The price increased from $10 to $20 per month. But more significant changes may be looming. As the City Commission prepares to have its Parking Advisory Committee discuss new plans, the concept of paid street parking — although controversial — could be revived as an option. “We are not talking about charging [fees] every day of the year, although that might be something worth discussing,” Lyons told the city commissioners. Commissioner Susan Chapman responded that she has been reading the book The High Cost of Free Parking. The city provides the parking department with a subsidy; that has cost about $2.2 million over the past four years. 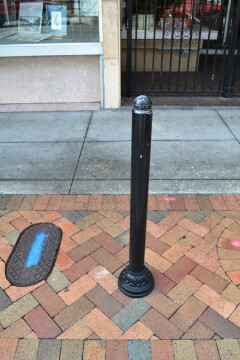 In recent years, the city has struggled with finding both a means to cover its parking department expenses and a way to ensure parking availability in downtown Sarasota. The installation of street parking meters in 2012 — a project that city leaders hoped would solve both problems — proved unpopular, and the meters were removed. On Jan. 4, City Manager Tom Barwin suggested gathering data that would show peak times of public garage usage. Analysis of the information could serve as the basis for rates and structures under a paid parking system if the City Commission opted for that alternative. Barwin said it is important to consider a sustainable means of funding the city’s Parking Division. “One community I worked in was in denial about it and ended up with a $10 million deficit in the parking program,” he told the commissioners. The city is implementing the flat $5 fee to park in the garages during the highest periods of demand, staff said. Those already included the DSA Fall Art & Craft Show, held Nov. 21-22, 2015; the Dec. 5, 2015 Holiday Parade; and the Dec. 31, 2015 New Year’s Eve festivities. The city will charge the fee up to 25 days during the year. Lyons’ memo noted, “This operation will ensure availability of parking spaces, and increased revenue for the [parking] enterprise fund.” It added, “The operation is directly related to parking demand and will be used during events where extra staffing for operations and maintenance would draw significantly on the parking staff resources.” The city staff estimates the new fees will generate $111,250 a year. The two-tiered time restrictions are in effect Monday through Friday from 9 a.m. to 6 p.m. in the State Street and Palm Avenue garages. The Palm Avenue facility has 200 two-hour spaces on the first two floors and another 535 four-hour spaces on levels 3 to 6. 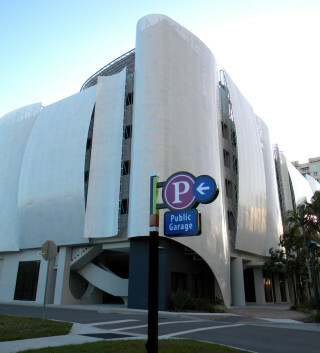 The State Street garage has 77 two-hour spaces on the first and second levels and 322 four-hour spaces on levels 3 to 6. Additionally, to make the city’s parking permit program more flexible, city parking staff members are reviewing the potential use of a pay-by-phone system that would allow patrons to purchase a daily permit enabling them to exceed the parking-time restriction and to pay the $5 fee in advance for entry to the garages during special events. Lyons told the commissioners that employee permit sales have been good thus far. In one month, the city sold 750 of them for the State Street and Palm Avenue garages, Lyons said. The employee permits allow downtown workers to park with no restrictions from 9 a.m. to 6 p.m. Monday through Friday.